Relays are a 4 letter word to many Ogaugers. However we put up with the 3rd rail and never utilize the obvious advantage for automation. FAQs,a lot about using unreliable expensive TAD using infrared detection, to activate a block signal or crossing gate,simply unnecessary with 3 rail. A relay is simply and electromagnetic switch. when current is passed through a coil electromagnetism draws a set of contacts either open or closed. The contacts act as switches. 12 and 24 volt DC coiled relays are most useful in model railroading. 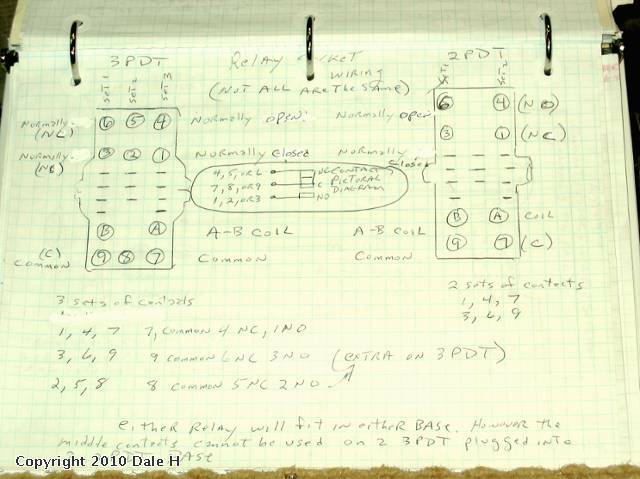 Relays can have one of more sets of contacts. SPDT,1 set, DPDT, 2 sets, 3pdt, 3 sets and so on. 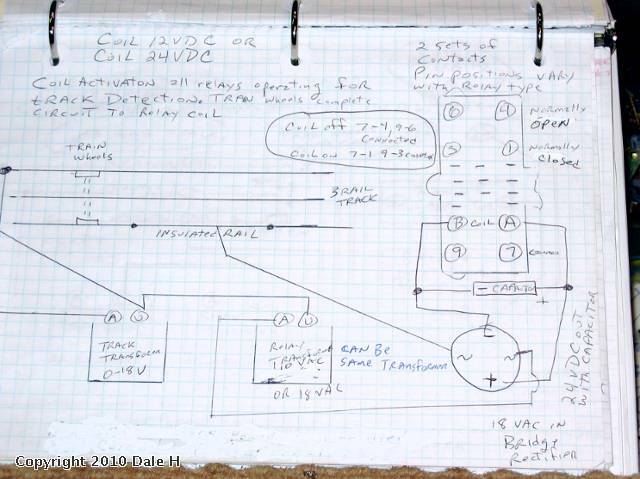 INfrared TAD have a relay in them which is activate by light sensors. Stand alone relays cost about $8,much cheaper. The only difference then is how do we activate the relay coils to switch track side accessories. With this method the metal train wheels and axle complete the coil circuit. So the answer is to use an insulated outside rail,easy to make with 2 plastic pins on more modern track systems such as Gargraves and Atlas. Simply isolate a section as long as where you want an event to happen during track occupation such as to switch an accessory on or off. With this method whenever a car occupies a block the relay will be energized and switch whatever is switched by the relay contacts. It can turn something on or off or do both at once such as turn a green bulb on and a red bulb off. The train need not even be powered. 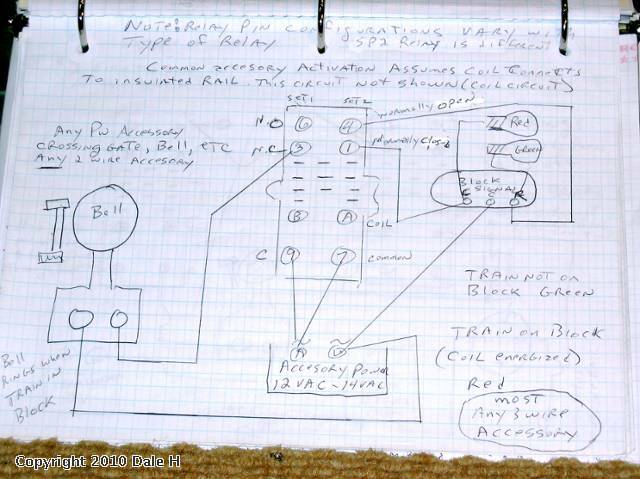 Here is a diagram of how to activate a relay with an insulated rail. 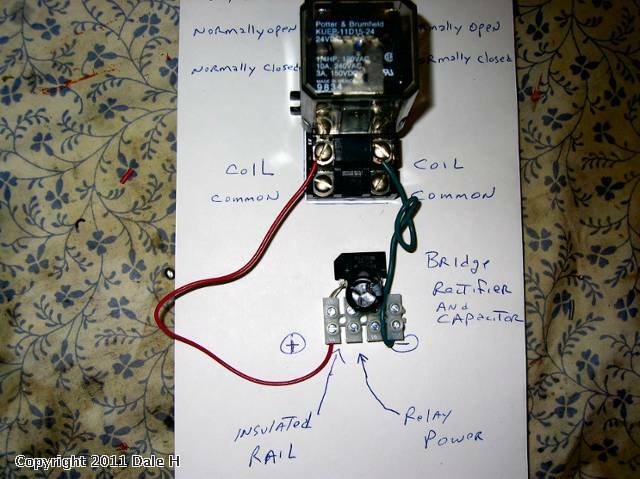 You can use the track transformer if it has an unused tap or a separate transformer with the commons connected to power the relay coils.. A capacitor across the coil reduces chatter from the intermittent contact of train wheels which complete the coil circuit. When a train occupies the track the relay is energized, when it is not occupied the relay coil is not energized. We can use the contacts to switch one or more different circuits. 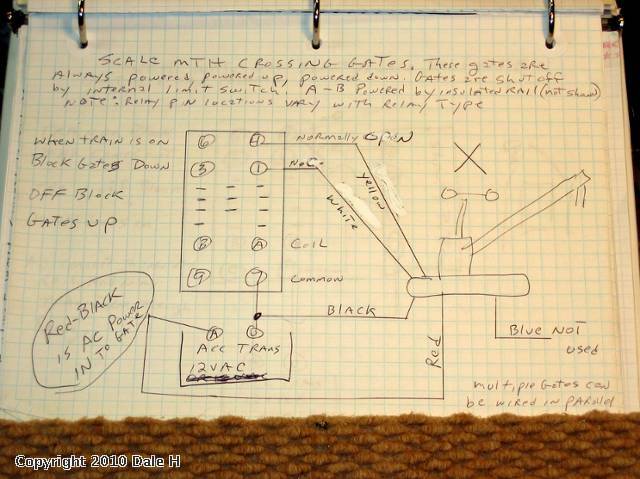 Turn a light on and off, change a block signal from red to green,turn on a coffee pot ,whatever. NOTE the wire from the bell should go to the NO contact,not the NC contact ,it is drawn incorrectly sorry for the error. see my posts about the use of relays in conjunction with timer modules, timed pushbutton circuits. and switching loads with relays if interested in the electrical section. Here is a typical 24 volt DC DPDT 15 amp plug in relay which could be used for block detection. The bridge rectifier and capacitor can be mounted on a barrier strip for no solder connections. Cost is about $8 per relay and $2 for the related parts as shown in the below picture. I have some extra ones I sell at cost to Forum members or you can get your own. Ebay can be a good source. Radio Shack is expensive. Just to add,the above circuit is fine for smaller layouts just using a few relays. If you have a more complicated layout with many relays,you can just use a separate transformer and one bridge rectifier. This will eliminate the need for individual bridge rectifiers to each relay coil. The separate transformer can be the starter set type. 50 watts or more is fine. Each relay coil usually uses only a bit over a half watt of power usually.Ã??Ã??Ã??Ã??Ã??Ã??Ã? 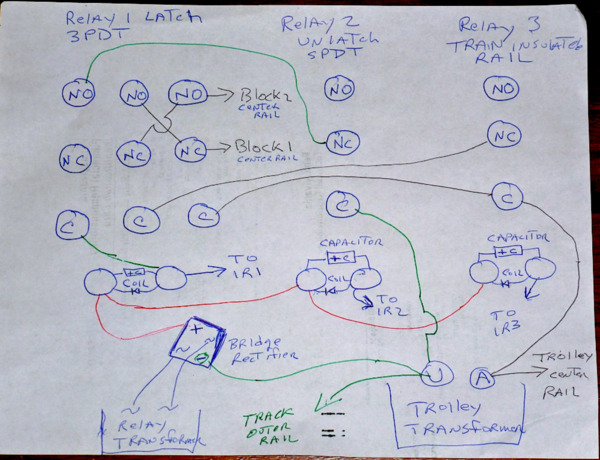 ?Ã?Â Here is a diagram from my trolley protection post at a cross over. Notice the coil circuit,forget the rest. The minus of the bridge rectifier shares a common with the track outer rail. Sharing a common is standard practice in electronics. If you are not familiar with it don't worry. As long as the hots are not connected also, there is not problem doing this. this is in fact true with any transformers sharing a common,phasing is not a concern unless there is a possibility of the transformers being put in parallel. You can add a capacitor across the + and - of the bridge. (1000 or 2200 uf,35 volt for example in proper polarity) So 10 VAC in from a transformer becomes about 14 VDC filtered for the relay power. 18 VAC in becomes 24 VDC filtered out from the bridge rectifier. For large systems I recommend 24VDC coiled relays. The reason is the transformer can not be turned up too high to fry the coils if accidentally hooked to the wrong post. Also many common timer modules can be used at this voltage. See the Mars timer post in my blog here. 12 VDC relays can also be used if a half watt carbon resistor is put in series to one of the coil leads about equal in value to the coil resistance. For example if the relay coil resistance is 120 ohms (you can measure with a meter) a 100 or 120 ohm half watt resistor will protect the coil from burning up. 12 volt timer circuits can be used with a 7812 voltage regulator circuit. Dale, Thanks for this info. I am going to my local hardware store today to purchase 2 12v relays. I will try to explain to the guy what I am doing and purchase the correct ones. I will purchase 2 of SPDT,1 units as I want to use the bridge for separate tracks and use the insulated tracks in different parts of the layout. You spoke of a Capacitor across the coil to reduce chatter !!! No clue what it looks like and no idea what to buy. We can get to that later I guess. No gates, just lights, so maybe there will be no chatter.